NEW ORLEANS – Winning the NCAA Division I Outdoor Track & Field team title in front of their home crowd at Hayward Field not only snapped the Oregon men’s 30-year national title drought, but it also clinched the Ducks their first John McDonnell Division I Men’s Program of the Year Award since 2010. 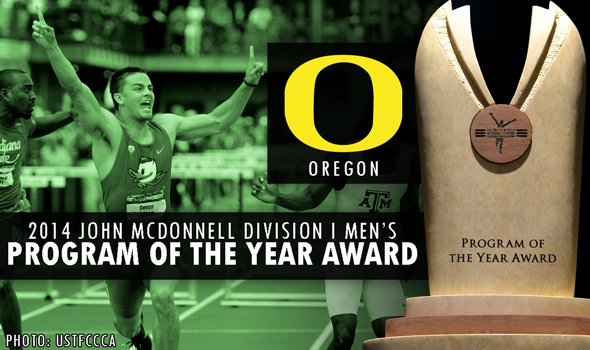 A pair of national team titles in track & field, along with a top-five showing during the cross country season, earned the Oregon men their third Program of the Year award, presented by the U.S. Track & Field and Cross Country Coaches Association (USTFCCCA). The USTFCCCA Program of the Year Award is awarded annually to the most outstanding cross country/track & field programs in each of the NCAA’s three divisions for each gender. In order to be eligible for the award, teams must qualify for each of the NCAA Championships. The honor for the Ducks breaks a tie with Florida State for the most award wins since it was introduced in 2008-09. Oregon ran away with the award as the only team to post top-10 finishes – or even top-10 showings, for that matter – in cross country and both the indoor and outdoor seasons, posting a final score of seven points to runner-up Oklahoma State’s 23 points and third-place Arkansas’ 23½ points. Arkansas won the award last year. Scoring is based on the team’s finish at each NCAA Championship in cross country and both indoor and outdoor track & field (i.e. 1st = 1 point, 2nd = 2 points, etc.) with the lowest total score for all three championships combined determining the award recipient. Ties among schools split points for positions taken. No men’s team since the current eight-deep scoring system was introduced in 1985 ever scored more than Oregon’s 88-point winning total, which was 18 points clear of runner-up Florida at 70. The Ducks got individual national titles from four different men: Edward Cheserek at 10,000 meters, a 1500-meter title defense by Mac Fleet, a javelin win by Sam Crouser and an upset in the 110-meter hurdles by Devon Allen. Cheserek also finished runner-up at 5000 meters to cap a stellar first collegiate season that included an individual cross country title and indoor national titles at both 3000 and 5000 meters. His individual indoor titles boosted the Ducks to their second indoor team title in program history, with the only other having come in 2009. Oregon outscored runner-up Arkansas, 62-54, to win the crown. Cheserek’s individual cross country title paced the Ducks to a fifth-place team finish at the NCAA Championships in Terre Haute, Ind. Oklahoma State posted its best Program of the Year finish as runner-up in the standings with 23 points. The Cowboys were third during the cross country season, sixth indoors and 13th outdoors. Arkansas finished third with 23½ points following a runner-up indoor showing, a ninth-place result outdoors, and a 12th-place finish in cross country. Rounding out the top five were Wisconsin with 29½ points and Florida with 34 points. The John McDonnell Program of the Year Award is named after USTFCCCA Hall of Famer and former Arkansas head coach John McDonnell. McDonnell’s Arkansas teams won a combined 40 National Championships and finished in the top ten in cross country, indoor and outdoor track & field in 24 of his 36 seasons in Fayetteville. Five of his teams won the NCAA Triple Crown.